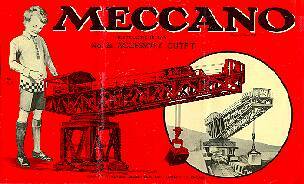 Meccano Limited originally released model plans for the Giant Block-setting Crane as a means of promoting sales of their new Geared Roller Bearing, part 167. The model was based on the photograph below, that appeared in the 1928 Meccano Book of Engineering and the May 1929 Meccano Magazine. This photograph was taken at Stothert & Pitt's construction yard in Bath, England. Some creative art work was applied to it along with the label: "Two huge Block-setting Cranes at work on harbour construction". The crane was sent to Antofagasta, Chile. It had an a-typical articulated undercarriage that allowed it to make very sharp turns. The man that can be seen slightly above and to the right of the centre, would have controlled the mechanism when it was laying blocks. A diver using a telephone would have instructed him when to raise or lower the block. The machine was driven by a steam engine in the boiler house at the rear of the crane. Underneath the boiler house were large hydraulic reservoirs. The free-wheel decoupled reciprocating hydraulic brakes were the true glory of these machines, allowing infinitesimal adjustments of the height of the load. There were several design flaws in the original model that I have corrected in my model. Firstly the base was too high, the undercarriage was not articulated and unless you had a very efficient and powerful motor the crane simply would not move! If you look back at the last page you see the difference in the proportions between my Blocksetter and the original plans above it. I also used an improved design for the drive mechanism so that the machine will move backwards and forward on it's rails. On the next page you can see details of how I articulated the undercarriage. Right: Meccano 1953 Instruction Manual Set 2A - Showing the Giant Blocksetting Crane. Meccano Limited also produced in 1954 a new Block-setting Crane model, leaflet number 7, that could be built with the number 10 set. This was a pale shadow of the former S.M.L.4 and while there were not sufficient parts in the number 10 to tackle this former giant, more thought (and perhaps more time!) could have produced a far better crane from the contents of the number 10 outfit. Meccano Limited acknowledged this themselves in the October 1978 Meccano Magazine where they published plans for a new model utilising parts from the number 10 set. This model was built and described by Bert Love. Paul Dale has built this model and an excellent description of it can be seen at his website. It was with some surprise to Meccanomen that Meccano S.A. chose the leaflet number 7 as a celebratory model to commemorate a 100 years of Meccano. They have chosen new colours and a special presentation cabinet for it. Point your browser here to view it. Left: Part 113 was one of a series of parts of this design. Only the one was ever introduced. Eight of them are used in SML4.